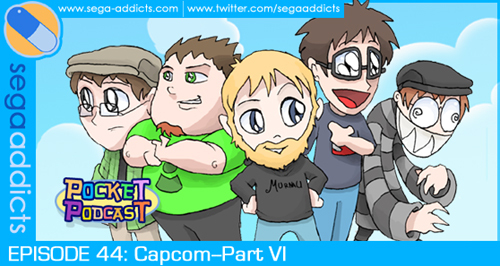 The SEGA Addicts cast continues their journey through Capcom valley as we finally sneak our way into Dreamcast territory. No episode would be complete without a few Street Fighter spinoffs and we got those with both X-men vs. Street Fighter and Marvel Super Heroes vs. Street Fighter. We also discuss Pocket Fighters, Darkstalkers 3, Super Rockman Adventure, and Resident Evil 2. Quite a nice selection of games, ain’t it? To get Tofu you had to beat through Leon’s and Claire’s A and B game with the end rankings of A (I think), so six times total. When you play as Tofu you only have a knife, but it’s actually pretty easy to beat his scenario. It isn’t playing the same game as Leon or Claire, you play basically a checkpoint mission from the sewers to the police station rooftop. The NGP a PSP4? Whoa! That would be interesting. I think multiplayer on the home console is still a force, the biggest, so I don’t know. I know this can be a big push for digital content, though. ^Oh, Hunk, too, I think. You had to get him before Tofu. It’s been a few good years since I did that. Yeah Tofu had ridiculous requirements for unlocking him. Thanks for the clarity though, Matty. Anyway, I don’t understand why people would want a portable PS3 if they can get a PS3 for the same price or $100 less. This portable war is starting out the same way the last one did. I’m more interested in the 3DS so far. But time will tell.